I remember how excited I was when I was turning 10. Double digits! However, it was bitter-sweet for me, since that was my last birthday to be celebrated. At least that's what my parents said for many reasons, I remember the next one I celebrated was my 15 B-day, when incidentally I found out that the Art high school I was accepted in is moving and I won't be able to attend it anymore, but that's another long story. In any case, on my 10th birthday I was extremely excited for one reason- for the first time I was going to choose my own cake. Because it will be my last birthday to be celebrated, my parents decided to let me choose whatever cake I want.ANY cake I want. I couldn't sleep with excitement. After a deliberation and many sleepless nights, I ordered it-a two tier chocolate covered cake ( I never saw a cake like that in my life before) with three white roses on top. It was perfect! The roses were made out of fondant of course and I've never seen anything so delicate and fragile that was going to be eaten afterwards. Little did I know, that years later I will make cakes like that myself.In fact I was so mesmerized by that cake that I was convinced that I will order the same exact cake for my wedding. Talk about planning when you are 10, heh.. I cannot believe how time flies...Now my son will be 10 in a week. It seems like yesterday he was my little baby, sleeping on my stomach, making the cutest baby sounds you've heard and smelling as nice as only babies can smell. I can't wrap my head around the fact that he will be 10. I just can't or maybe I don't want to. It is a bitter-sweet moment again and there was more than one tear shed when I began planning his birthday this year.I mean, I always want to please him on his b-day and I always go along with his ideas on themes and stuff. I never had that growing up and I want it for my children. I am always excited to do it and although sometimes I complain how much work it is, how much effort it takes, it always warms my heart to know that my kids got something they wanted in celebration of the fact that they've been born and became a part of our family. This year's theme I embraced wholeheartedly and I couldn't wait to start organizing. 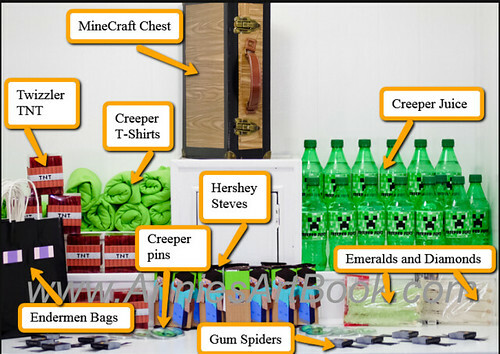 As you can imagine, there wasn't a lot of choice with Minecraft Birthday Party supplies, so I had to make them ( yeah, what's up with that Mohjang, we should talk!). What's a party without invitations, right? What are invitations without envelopes? 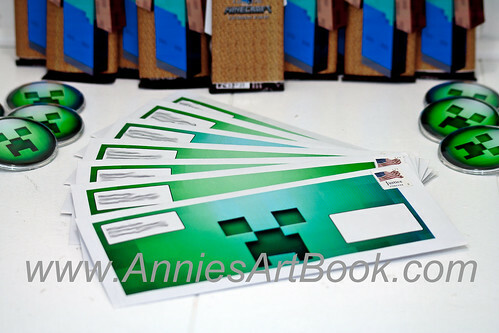 Creeper envelopes, yay! I'm just glad the kids were not home when I made these, because my cursing supply was exhausted by the printer's lack of cooperation. And here you can see the whole shebang, except the decorations of course,they will be in the next post. Isn't this cool?? ?The gum spiders were probably one of the most time consuming things, because I had to come up with a pattern for the legs and then cut them by hand. 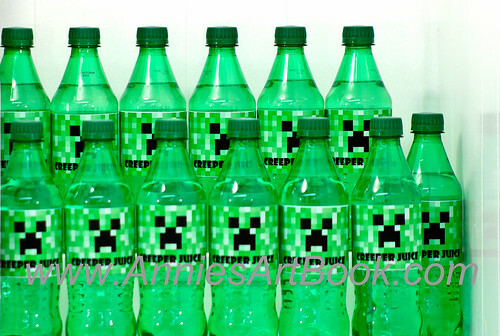 The Creeper Juice is just Sprite that I've changed the labels of. Who doesn't love Hershey Chocolate bars? I decided that Steve on the front and back of the chocolate will be best.The Steve on the front is actually made of card stock and glued separately, so it's sticks out a little that gives it a bit of a 3D effect. 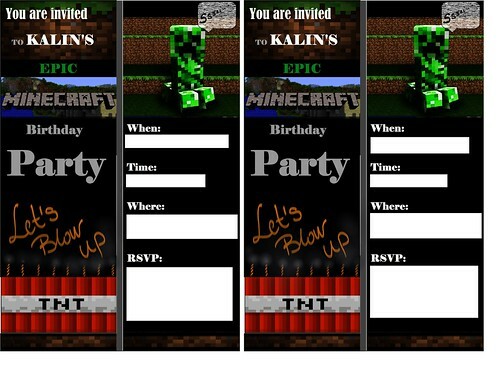 On the back it says " Kalin's Epic MineCraft Birthday Party". I really like how these came out. 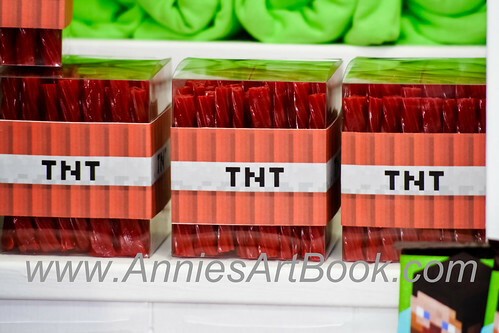 And since I promised in the invitation that we'll "blow up", we would need some " TNT" for that, right? The strawberry Twizzlers came in handy and the transparent boxes I got were just perfect! I wish the printer ( again) cooperated more and the color of the print outs I made could actually be recognized as red, not as a bloody orange, but what can you do. The pins were pretty easy to put together. I think the actual pins were $3 for 5 pins and you can put any picture you like in them. 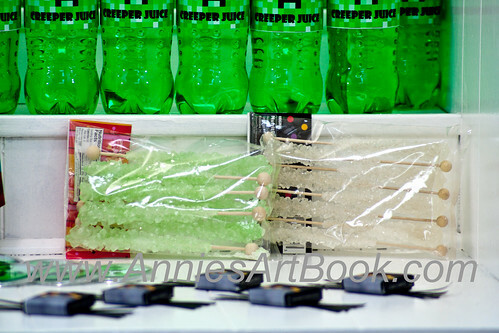 The "emeralds" and "diamonds" are just sugar sticks. I'm so glad I thought of it. 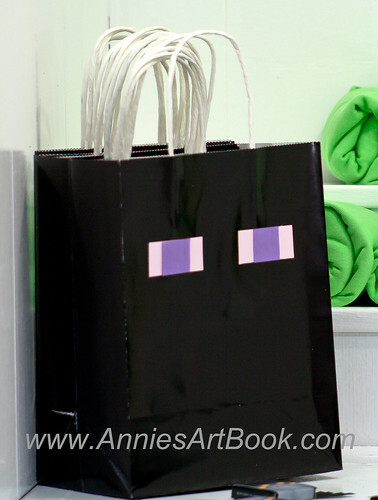 The Enderman goody bags are one of my fave, I just hope they are strong enough to fit everything in them. So, the plan is to have the green T-shirts that you saw behind painted by the kids with "Creeper" on the front. We'll see how that's going to turn out, especially if the weather is not nice and we have to be inside. In any case, I am looking forward to sharing the rest of the decorations and the cupcakes. This is amazing! The kids will LOVE it!